Movies about kids who escape grief and family trauma through a world of pure fantasy are nothing new, from Where the Wild Things Are to 2016's excellent A Monster Calls. 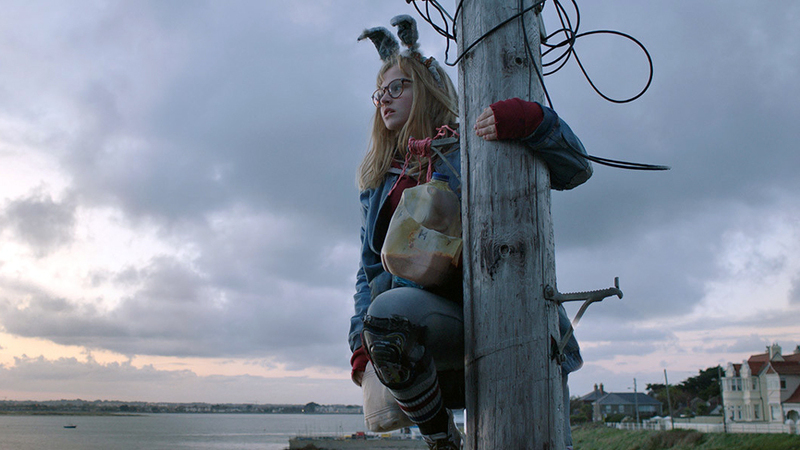 The latter film will be what first-time director Anders Walter's I Kill Giants will draw comparisons to, both featuring similarly troubled youths whose encounters with humungous creatures change their lives forever. But it's important to note that Joe Kelly's graphic novel from which the film is based actually predates Patrick Ness' book, and the film adaptation by Walter is thrilling and heartfelt, more than capable of standing on its own regardless. 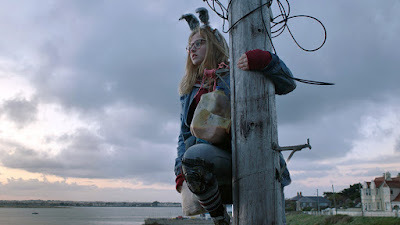 One of the film's greatest and most unique attributes is its star, Madison Wolfe, and her performance as the troubled and quirky Barbara Thorson. Dressed in clashing pinks, blues, and magenta with a pair of bunny ears on her head, Barbara has dedicated her life to protecting her small hometown from the scourge of invading giants. A D&D fanatic who has learned more than her share from the game, she wields fantastic weapons and sets unusual traps to lure and catch them, these creatures that only she can see. The people in her neighborhood think she's nuts, and of course it has made her a bullied pariah at school where guidance counselor Mrs. Molle (Zoe Saldana, the film's biggest name by far) tries to help in any way she can. Kelly, who penned the adaptation himself, takes us through the sensitive contours of Barbara's home life, while constantly teasing whether the giants she sees are real or figments of an over-active imagination. There's a distinct lack of parental supervision in the home, with only an overworked older sister (Imogen Poots) managing things and two older brothers who loaf around playing video games. Already an outcast just about everywhere else, Barbara finds it's pretty much the same situation at home because her outlandish antics are causing problems for her siblings. It's weird when the neighbors see your sister hanging out at the top of telephone poles. So it's no wonder she escapes out into a world where she is in full control. And what a world it is. While the budgetary constraints are obvious, Walter, who has an Oscar for Best Liv-Action Short Film under his belt, uses CGI sparingly but effectively in creating the vast array of giants that come stomping into town. But Walter saves his best for capturing the one-foot-in-reality world Barbara finds herself in. The greying skies, crashing waves of the coastline, and the gloomy woods are like alternate realities for Barbara to lose herself in. Kelly's screenplay captures the cruel way in which kids treat one another in school, and how devastating its impact can be. A film about dealing with sorrow and loneliness, it can be a touch too gloomy at times as we see Barbara's struggle to relate with the people around her. There's a devastating scene in which she uses puppets to try and communicate her feelings with her sister, and another where she blows up at Sophia (Sydney Wade), the new girl in town and Barbara's only real friend. But there's also a ray of hope that shines through, and Barbara's offbeat personality makes for a fun clash with her disbelieving peers. There are a couple of mysteries that hang over the story, the most important dealing with the true source of Barbara's unhappiness. The answer comes swiftly and tenderly, perhaps too tenderly, bordering on mawkishness. But I like that there are no easy answers presented for Barbara, because a tough girl like her wouldn't stand for it, anyway. Between A Wrinkle in Time and I Kill Giants we're looking at a great moment for girls everywhere to find warrior protagonists they can look up to, and perhaps see something of themselves in. But this is a movie boys can also be entertained by and find value in, because we all wish there was a way we could keep the monsters of sorrow away with just a swing of a sword.